Today, a final posting for this blog of the Beetroot Tree gallery. Having made a move from the UK to New Zealand 2 years ago, the Beetroot Tree was handed over from my care into to new mentorship just before Christmas 2012. Unfortunately that winter was one of the hardest and longest that the UK has suffered for many years, this, along with the uncertainty of the economic times rather set the tone for the next 18 months and though every effort was put into restoring the gallery visitor numbers and sales, it became impossible to continue trading by June 2014. 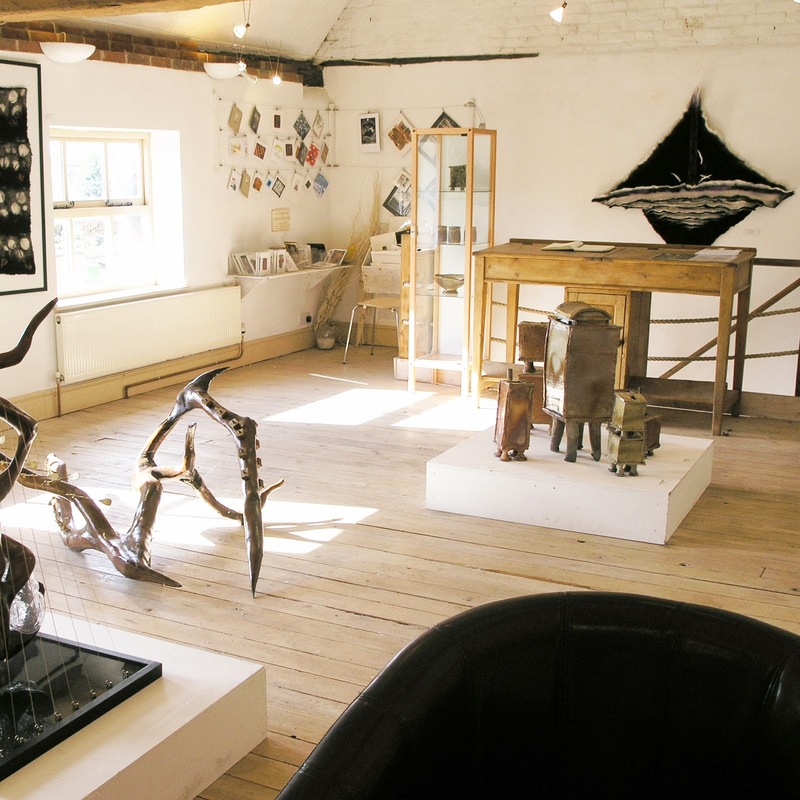 The decision has been made to close the doors to the public and begin the long process of sending work back to the artists and clearing out all of the 'stuff' which has accumulated in 15 years in the barn. If you are an artist with work remaining at the Beetroot Tree, please contact Paul though the facebook page to arrange it's collection. If you think there may be furniture or equipment which we still have that might be of use to you or a group you belong to, also contact via facebook and keep a look out for a last sale day coming soon. Over the years we have been able to bring to the attention of our visitors, in person and on line, the work of many hundreds of accomplished artists and designer makers. We have also hosted workshops for adults and children, played a part in festivals, hosted installations involving participation in the form of creating work, soundscapes, music, dance and video. And been able to provide a calm refuge from daily life for many thousands of you. I would like to thank the many people I have met and worked with during the life of the Beetroot Tree for being so loyal and supportive. 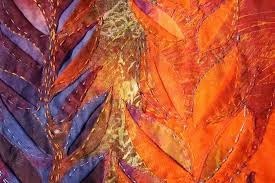 The Beetroot Tree gallery's latest exhibition by the Textile Study Group is a vibrant and sophisticated blend of textile pieces. Artists represented: Ruth Issett, Sian Martin, Penny Blackburn, Jenny Burnfield, Janina Evans, Sheila Mortlock, Kay Greenlees, Jean Draper, Rosemary Campbell, Sarah Burgess, Ann Wheeler, Mary Sleigh, Bobby Britnell, Shelley Rhodes, Angie Hughes, Dorothy Tucker and Alison King. It was really hard to chose which of the amazing pieces to write about, so I decided on the following artists at random. Ruth Issett's work is stunningly colourful. 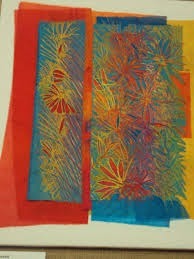 Layers of dyed and printed fabric are stitched and cut back to form natural foliage forms. I really liked the textural effect of cutting back to the fabric layer underneath combined with adjacent stitching of the same colour. Her foliage series look to me like wheat fields in varying light: dawn, blazing autumnal afternoon and evening fading into night. I adore Jenny Blackburn's Serendipity series. I wanted to set up a deck chair and pour a glass of Pimms. I could almost hear the bees humming as they moved from flower to flower. The sheer detail in her work is awesome. Layer upon layer of texture take you on a journey into the garden. 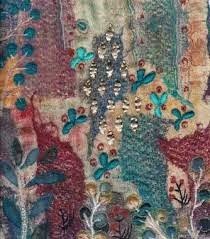 She works by layering dyed and printed fabric and then using delicate machine embroidery to show the foreground structure. Details are picked out in metal thread stitched by hand. Sian Martin's pieces are inspired by the Japanese technique of Shibori, in which cloth is bound, stitched, folded, twisted and compressed before dying. Sian uses fabric and paper stitched together to make new textile surfaces. 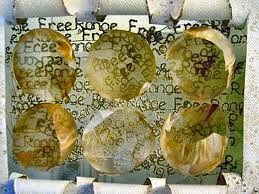 In the piece on the right she has used free range eggs to create the form of the inner, fragile shapes. 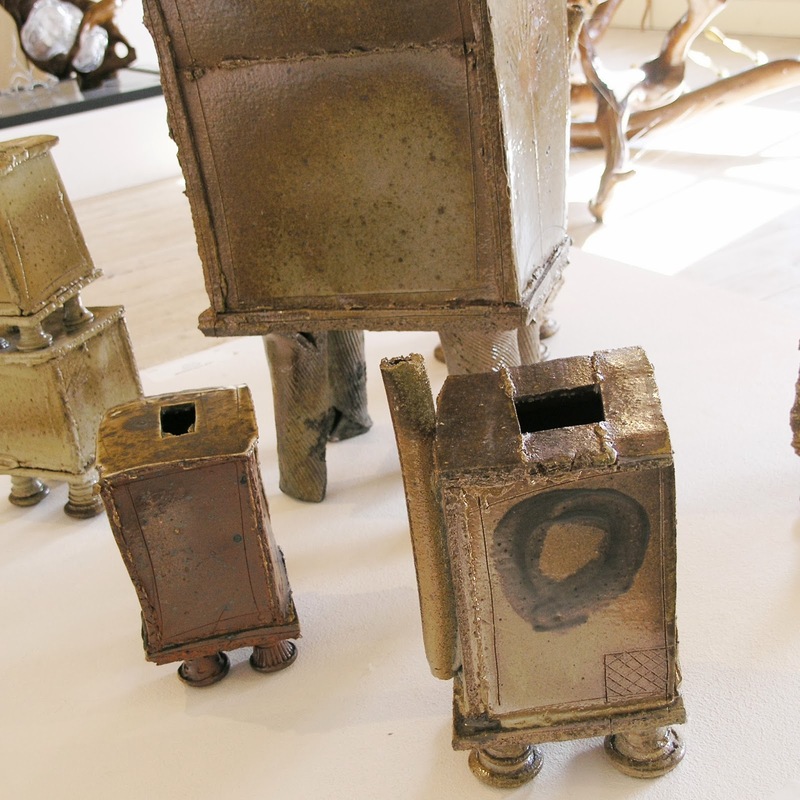 Sian uses recycled materials in her work to reflect her concern for the environment. Penny Burnfield's work is influenced by her fascination with history, both social and personal. She uses any material that best express her ideas. 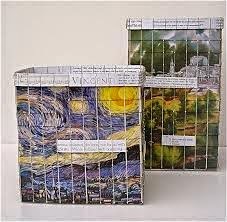 The 3D piece Starry Night is a woven structure that incorporates images by Van Gogh, the words of Don McLeans' famous song, scientific information on spiral galaxies and text about Henri Dutilleux's orchestral work of the same name. Dazzling. Diana Worthy - A Retrospective. Ever thought of leaving the grey skies of England behind and swapping them for the sun-drenched hills of Andalucía? Ever thought of having a change from the familiar pet cat or budgie and opening your heart instead to a herd of alpacas? That’s exactly what Diana Worthy has done. When she moved to Spain, Diana already had an interest in textiles. She began weaving, but soon lost interest in the straight lines of warp and weft. 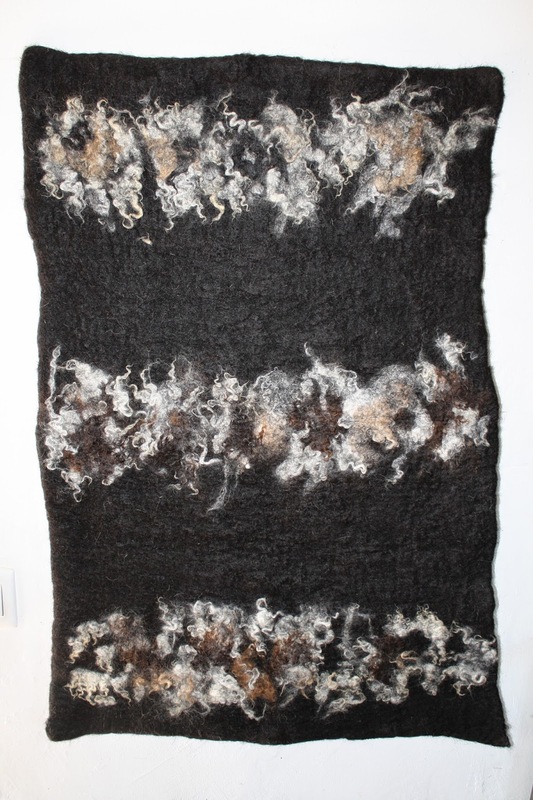 Then, in about 2008, while searching for a more lively form of textile, she began experimenting with felting the wool from her new pets - a herd of alpacas. 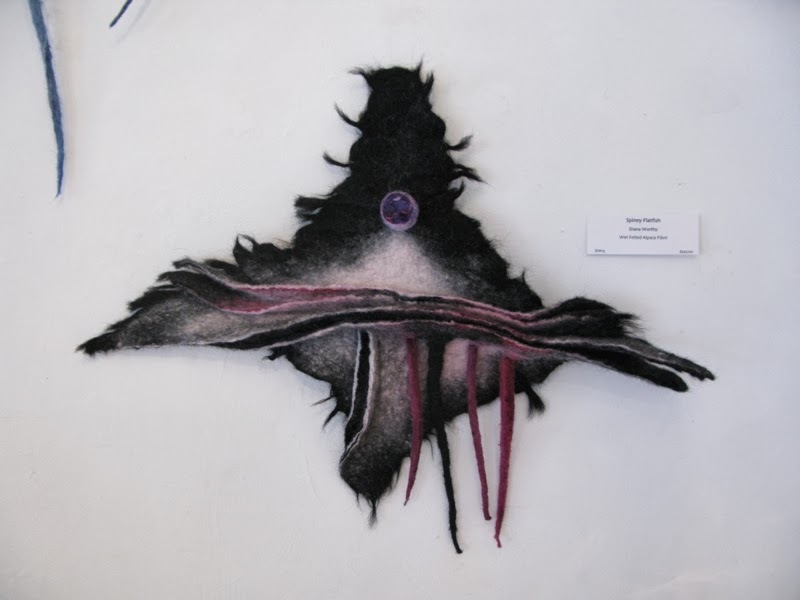 Although she learned a lot about felting from books, she gained much of her knowledge from her own experimentation. Despite having been told that it’s impossible to felt alpaca, she soon fell in love with the fluid, unpredictable nature of her new medium. She became what she calls a “painter in fibres”, doing things to wool that “you would never do to your favourite jumper”. By layering, soaping and rubbing, she learned to create a strong welded fabric that could be cut and moulded into wall hangings, pictures, and 3D forms. She finds herself constantly surprised by how each layer of colour merges with the one beneath and above, creating blends and effects that “always end up better than expected”. She told me that the more you put in, the more you get back in terms of movement and creativity. Each piece gives ideas for further projects. “There is no limit to what you can make with felt.” Also, there are no rules – “if it works, it works”. Diana’s next projects will involve working more in three dimensions, producing pieces like the one to the right and above. Talk and Tapas event Saturday 15th March at The Beetroot Tree Gallery. I’ve never seen an alpaca, let alone sniffed one, but as I put my face close to one of Diana Worthy’s textiles, I’m transported to the heat of Spain and surrounded by the warm, comforting smell of her pet alpacas. 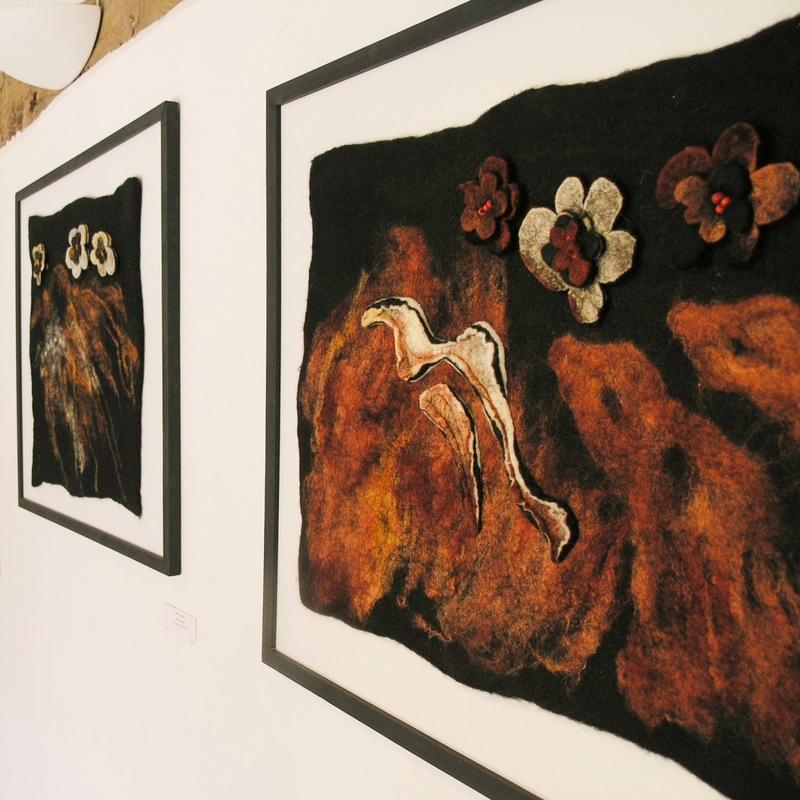 Diana uses the fleeces from her animals to create wall hangings in wild and wonderful designs - each reflecting some aspect of nature. This one is a flat fish. She describes wet-felted alpaca wool as having “a living, moving quality, with a mind of its own.” Ideas and inspiration come to fruition as she works the fibres, allowing them to move of their own accord - to pucker or twirl, to feather or curl – giving rise to the finished design. Ben Brierley, ceramicist, is also featured. In a glass display case, under lock and key, sit a dish that shines like the back of a cowrie shell and three beautiful cups. They appear normal enough - they certainly don’t look as though they’re going to walk off when your back is turned. However, the free-range pieces on the floor, with their vertical spouts and little round feet, look almost naughty. They remind me of the scene in Beauty and the Beast when the teapots dance. Why aren't they contained like the non-animate cups? They look too boisterous to be left unguarded. 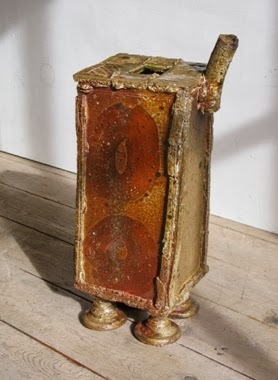 The third artist showing work at Of Heat and Chaos is Jack Sawbridge. His wood and glass pieces are based on the aging, creaking joints of ballerinas. Each piece has a blown-glass blob lit from within, held by wooden structures that look like polished tree roots. One piece reminds me of a woman carrying a pile of shopping. She’s squeezing her lit-up glass so hard that it’s erupting over and under her arms. 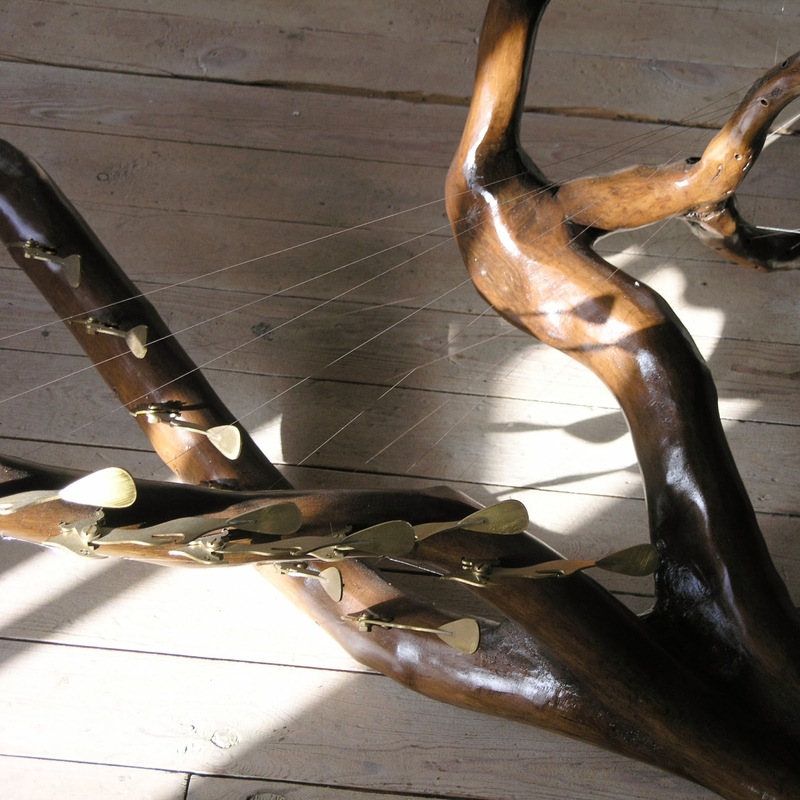 Other pieces have guitar strings, that can be tightened or loosened, attached to the wood or glass, representing tendons and ligaments. In one piece Jack has tensioned the strings so that when you pluck them, the note drops down like a sigh. I love the warmth and humour of this exhibition. I’m not alone in the feeling that, once the gallery doors are shut at night, the wet-felt alpaca flatfish will smile and blow bubbles, the ceramic vessels will potter about wildly, and the light and wood pieces will flex and turn, giving off musical notes and squeaks. In the morning, the shapes will look almost the same as the day before. Almost. You can meet the people responsible for these hot, chaotic creations and find out more about the process behind their work, at the Talk and Tapas event on Saturday 15th March. Walking into the Beetroot Tree Gallery's Open Exhibition is like walking into an Aladdin's cave. There are lot of entries this year and all are of a very high standard. There are paintings, textiles, sculptures and jewellery, and some unusual 3D objects. Here are a few pieces that caught the gallery's attention. 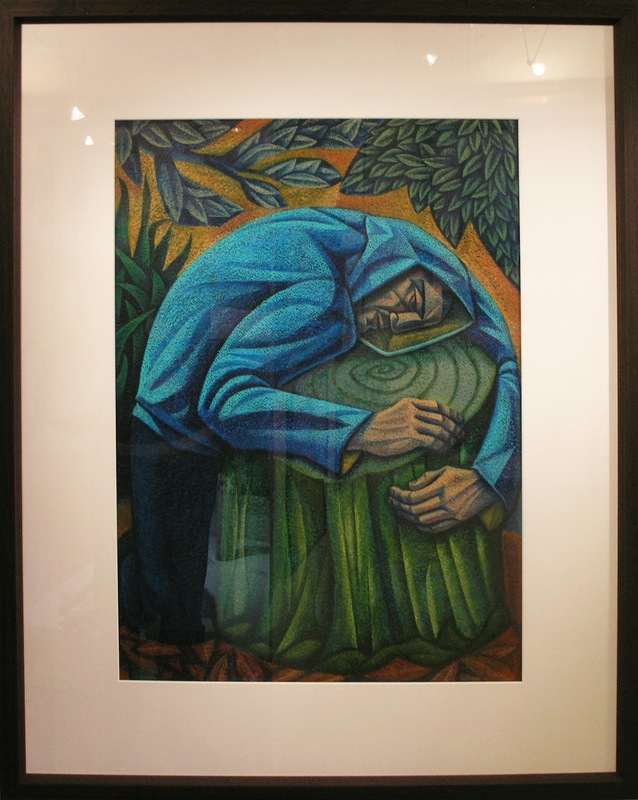 Michael Cook's Gethsemane is stunning. Paul, the gallery director, told me that while the painting was waiting to be hung, it was leaning against the wall in shadow. Suddenly, a ray of sunlight came through the window. As the light hit the paper, the colours in the picture shone as if lit from within. Michael Cook hides spiritual symbols in his painting. Can you find the fish? 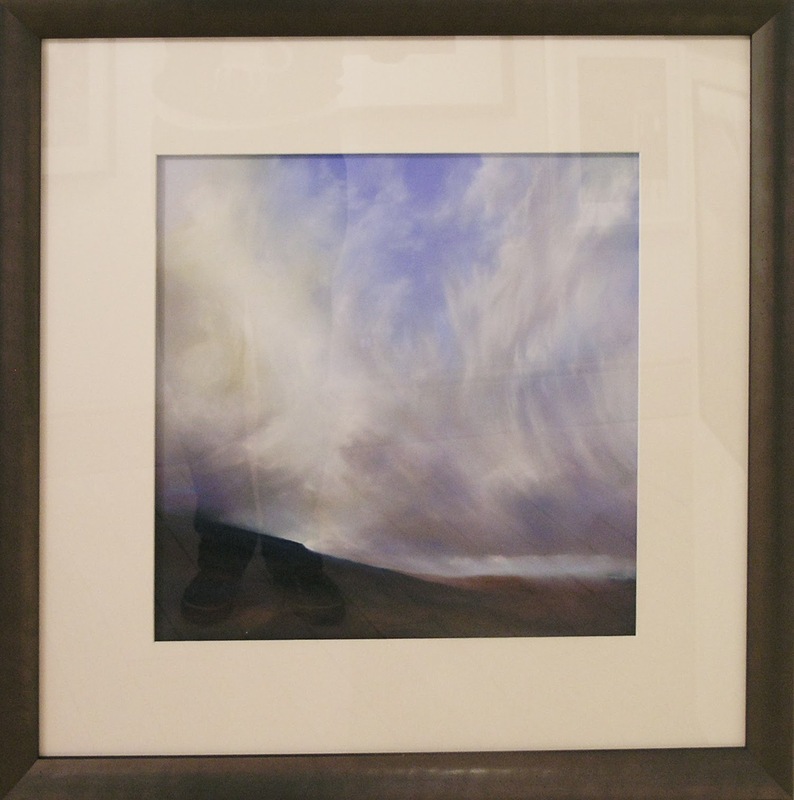 Sandra Orme's landscapes are inspired by walks in the Peak District. They are full of movement and power. If you look closely at the sky, it's almost like looking at an abstract painting. 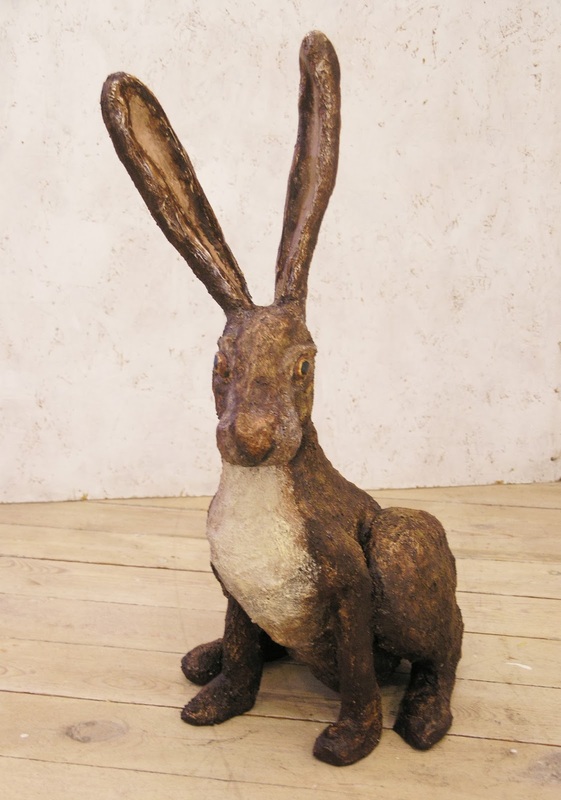 Helen Ellwood's hare, made from paper, card and wire, is another piece that looks lively. 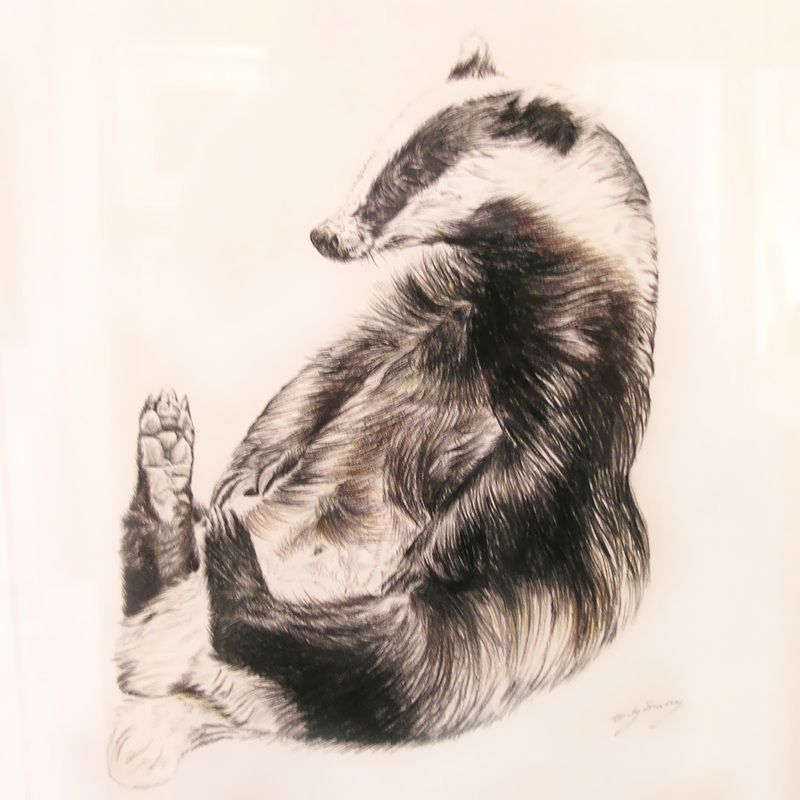 Helen uses her knowledge of animal anatomy to give her creatures a realistic look and then adds detail in the eyes and posture to give each one a unique personality. Harry the Hare sits poised on his plinth as if ready to spring. 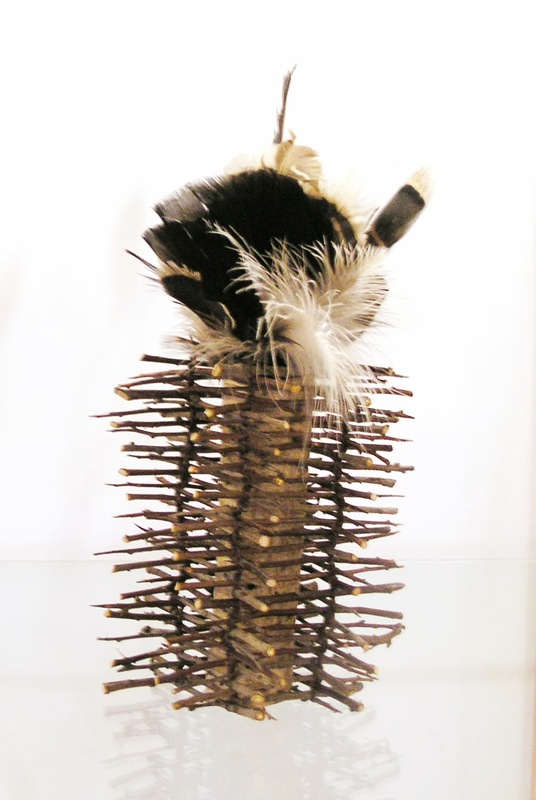 Thorn tower is constructed with twigs and feathers. 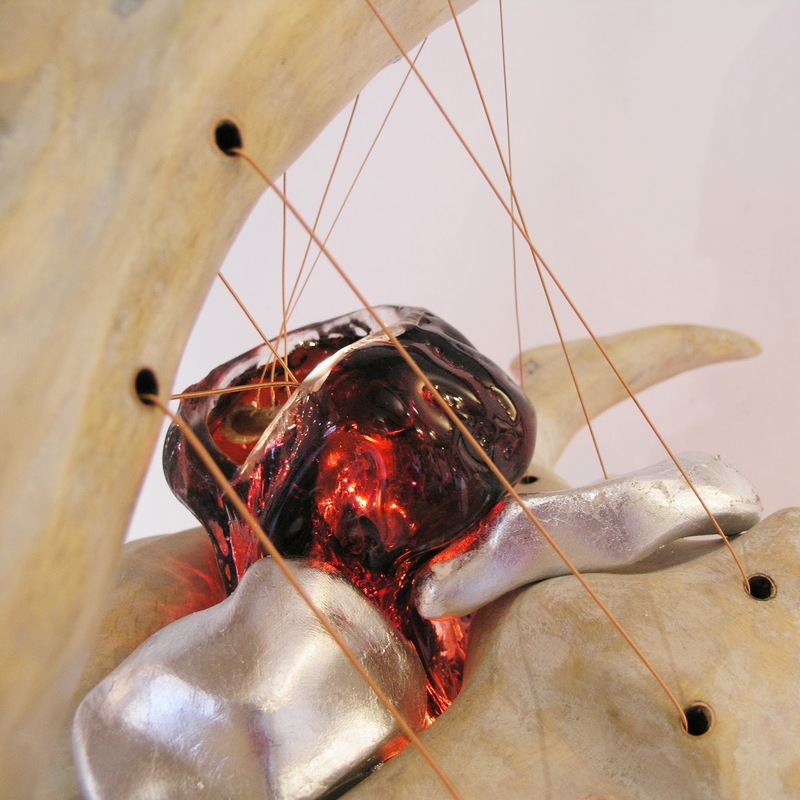 Jane uses traditional techniques such as tying, stitching, twining, coiling and binding to produce her delicate sculptures and vessels. 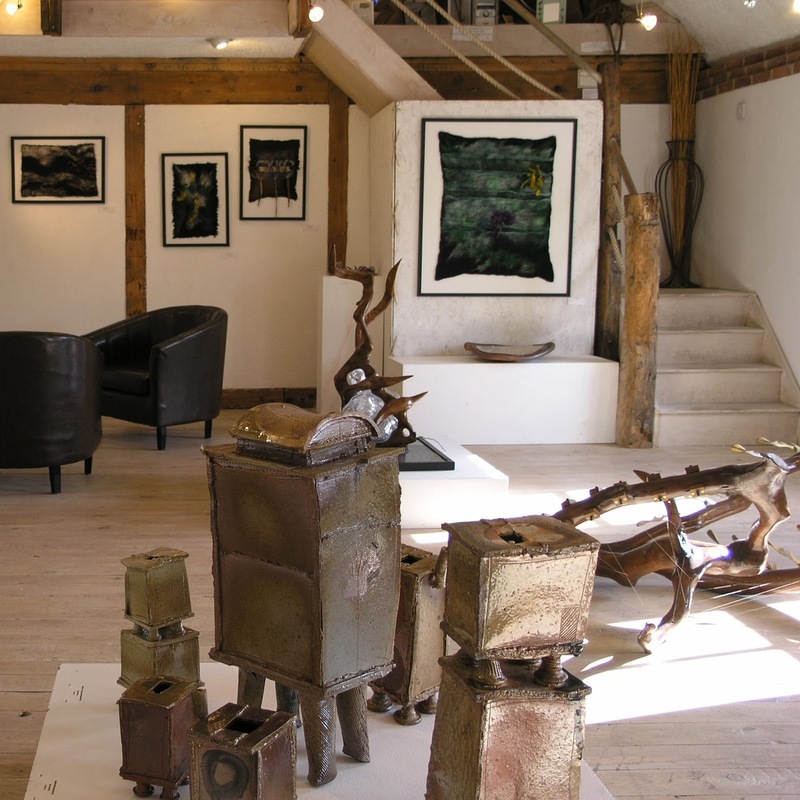 Wherever possible, the gallery employs artists. The staff somehow find time to produce their own work and keep the gallery afloat: cooking food in the vegetarian cafe, dealing with fellow artists, organising exhibitions and making very good coffee. 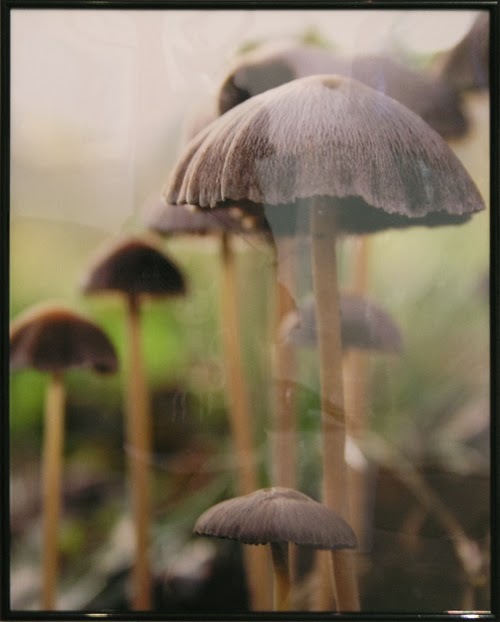 Nicole Orgill's photographs intrigue me. They celebrate the tiny world that people often hardly notice. Fungi and grasshoppers suddenly become beautiful when seen this close up. 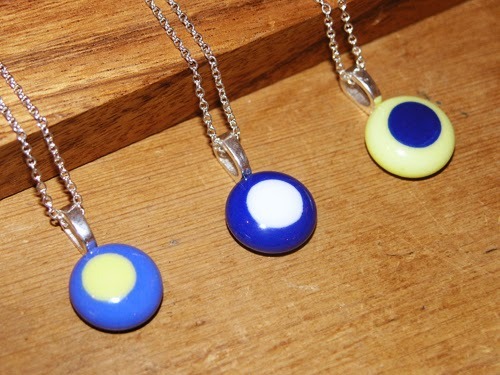 Yvonne's colourful jewellery combines layers of Bull's-eye glass and silver. Some have a subtle blend of colour, while in others she lets the colours clash in a vibrant way. This is definitely jewellery to get you noticed. I love Emily's drawings of wildlife and flowers. This badger looks soft enough to stroke. Her work is technically accurate and yet she brings out the character of every creature she studies. 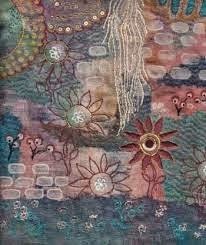 She also 'draws' with thread to create amazing textiles. I can’t believe that I am now in the air once more heading to New Zealand. I have spent 7 weeks in the UK, visiting groups to talk and teach, I had a stand at the Knitting and Stitching Show in Harrogate and have been helping out (or sticking my oar in) at the Beetroot Tree. I have to thank my Mum and Dad as ever, for allowing me to disrupt their already busy routines. I am sure that they are ready for their house guest to leave after all of the the added complications of my coming and going, eating at odd times, taking one of the cars at regular intervals, extra washing, ironing and cleaning. It is a lesson for me to remember – you never stop being a parent. All parents are told this at an early stage in their family’s development. I think perhaps it is only when your own children are older, when they could be independent being at an age when, as a child or young adult yourself, you image yourself to be on a separate trajectory from your parents and can’t imagine why they should have concerns for you and certainly should not need to suggest or impose upon your behaviours, that you begin to realise what it means to ‘never stop being a parent’. My children are now at that stage and I fully comprehend the sensation that they will always be my children to help and support. This makes me truly grateful for the hospitality and generosity my parents continue to give. It seems to have been a trip especially full of making work. So much for much in the way of social catch up, this trip has seen me spend a huge amount of time creating work. There were three workshops to make the samples for, all of the work to show at the Knitting and Stitching Show, then 50 Christmas cards and an embroidery to commemorate my the Golden Wedding Anniversary of my parents (to keep this secret, this had to be completed after going to bed at night and during the evenings after the Knitting and Stitching Show had closed each day). I continue to hope that on future trips I will be a lady of leisure between engagements and enjoy more cultural experiences. Dream on! The third week in November is the Knitting and Stitching Show in Harrogate. On the first day the weather was trying to snow, and having been snowed in at this show three years ago I was slightly apprehensive, but it soon became obvious that the ground was too wet to allow any snow to settle. The trees have turned to their proper, and stunning, autumn colours, beautiful gold, copper and red. The exhibitions are always stunning, a real treat. Where else in the country can you find such a concentration of exhibits including original artists work, from well known textile artists to new graduates, historical and cultural displays, and vast knowledge and art supplies in one place? The main exhibitions this year included work by Dorothy Caldwell, Sue Chapman, Viv Prideaux, Bobby Britnell and Ruth Issett, Jan Beaney and Jean Littlejohn, a display of historical and new crewel work by Phillipa of the Crewelwork Company. Jan and Jean, as always accompanied by their better halves! Ruth Issett, also with better half, Chaz. Val Holmes giving the game away. Not that we always have a bottle on the go, but it helps! Viv and Kev from Art Van Go. Smiling even at the last! Using every inch of space on the small stand! And to see more of the new work, look out for images on 'alysnsburntofferings', or visit the exhibition at the Beetroot Tree where they are on display until the 4th January. Once back on kiwi soil I am hoping for a bit of family time. Both of my girls will have finished school for the year and will have time for some social activities (this often involves me taking them shopping for ‘essential’ items such as party clothes). The summer months in NZ are also a time for festivals and celebrations which we enjoyed last year and look forward to again. Christmas is just around the corner. Let us hope for another lovely long dry hot summer. I return to the UK early in July 2014 for another ‘tour’, taking in Norwich, Wales, Hertfordshire, various dates in the Midlands including the huge Quilt Show at the NEC in August. Have you ever noticed that visiting a show by yourself is a different experience to visiting it with a companion? I often find that another pair of eyes on an artists' work helps me to see and feel more at an exhibition, even when we disagree about our reactions to it. In fact, that is what is so valuable about discussion. It doesn't make you or your companion more right or wrong than each other, after all opinion is only opinion and personal reactions are unique. “It’s like we attended a different show,” exclaimed guest Martin Patrick on the visual arts podcast I host, Circuit Cast last week. Such was the difference in our impressions of an exhibition (Soundful at City Gallery). What was old hat for me, proved stimulating to him. So it often is, and should be. Relish the diversity of taste around fine things I say. Tussle with it. Particularly when contemporary art itself continues to get ever more varied in approach. Feelings can also vary widely across an artist’s practise. Art is speculative. Good artists take risks, leading to a mix of failures and great pay offs – far more interesting than years of ho-hum production. In all this flux the role of the critic is to empower difference in opinion and our confidence in stating it. It’s often more interesting when you disagree. " So next time you visit the Beetroot Tree, bring a friend to talk to, catch us at the desk or when serving your coffee and have a chat about the pieces on display then we will all have a richer, deeper experience.